Gone are the days of manual creations made with the simplicity of pencil and paper. Today’s offices and home offices use as much technology as possible, including PCs with all sorts of monitors; most which are not ergonomic. Computer monitors have been proven to lead to conditions such as migraines, backaches, and neck pain. Improper monitor placement can result in eye strain and often, “office attractiveness" gives way to what is not only ergonomic, but safer for the average everyday computer user—a computer monitor stand that is ergonomic and comfortable. We took a look at some of ergonomic stands and arms to reveal features and affordability. Ergo In Demand offers many ergonomic computer monitor stand solutions from floor stands to desk mounts and even notebook stands. This company offers so many types of ergonomic stands, you may have to do some browsing and prices range from the low to the very high. Dual LCD Desk Stand with Horizontal Arm – At 14 inches high and made of durable steel, this monitor stand comes with a 10-year limited warranty. It’s also VESA certified for easy installation. The only con from owners of this stand was its weight, but that was far outweighed by the easy to use adjustable height, durability, flexibility, and stable base. Priced at just under $250, users felt the price was worth its lasting quality compared to some other purchased ergonomic computer monitor stands that were hard to assemble. This particular monitor stand is good for 25 inch LCD monitors, but larger sizes are available. Swivel Laptop Computer Stand – This sturdy and customer-praised ergonomic laptop stand even swivels! At a price just over $30, you can adjust the height and use the tilt feature to reap the rewards of this stand. 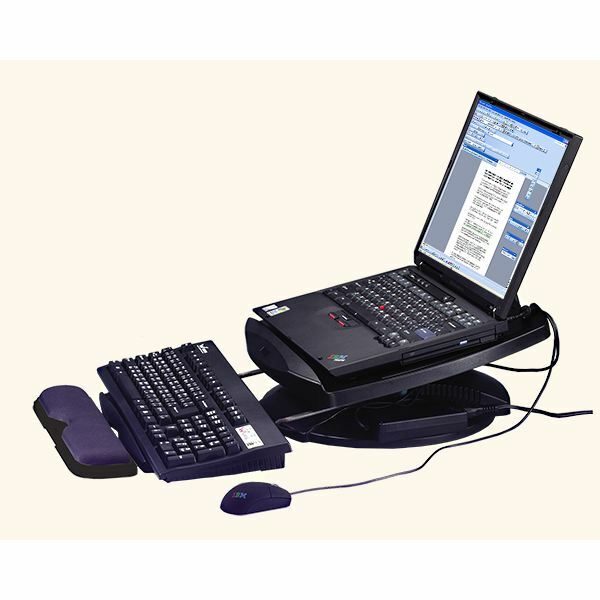 It comes with a cable organizer and a metal keyboard extender if you want to use an external keyboard to relieve the stress of being at the computer all day. Due to its angle, it’s an automatic laptop cooler and the platform is kept securely in place with non-skid foam. A perfect choice for all laptop users. An awesome accessory to buy along with your laptop bag! 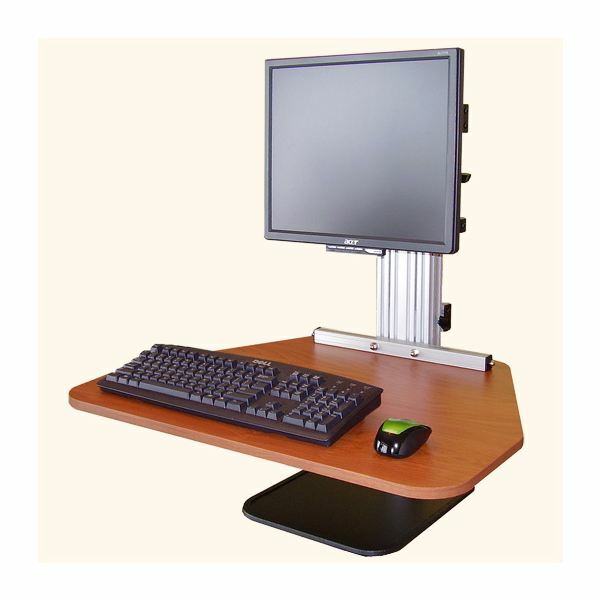 Sit Stand Desk Top Workstation with Single Monitor Mount – This is a customer favorite from Ergo in Demand. The work surface comes in cherry, putty or light maple and this made in the USA ergonomic computer single monitor stand will cost you—it’s priced just under $530. It prides itself as allowing movement “smoothly from a sit to stand position," to help eliminate symptoms such as neck and back pain as well as eye strain. The stand itself has tilt, pan and a portrait-to-landscape rotation feature and is also VESA certified for easy installation. Monitor weight capacity is 15 pounds. This pricey monitor received over 200 reviews from satisfied customers as far as being environmentally-friendly when it comes to monitor stands. 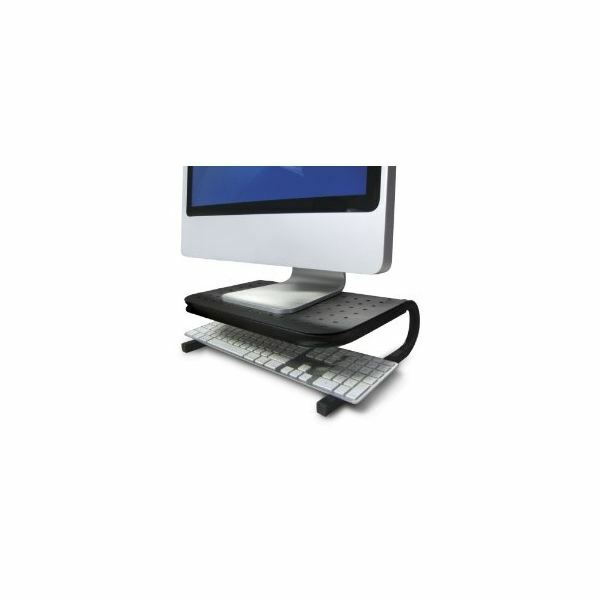 The many ergonomic computer monitor stands available from Ergo in Demand have product specifications your IT department can download prior to buying, but do some browsing, as there are many and some require optional equipment or accessories. Ergoware, the makers of what they boast as “ergonomic office products," have quite a selection of ergonomic computer arms to keep monitors in positions and levels that are beneficial, not detrimental. This company offers both single and multiple arm stands that are environmentally-friendly and for those looking at the green office, their products are made of 90% recycled materials. We looked at both single and double arms stands for flat monitors. 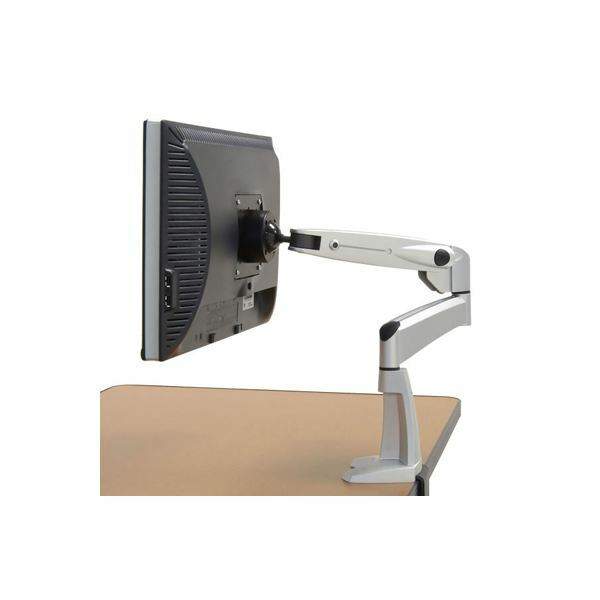 Ergoware offers numerous types of monitor arms, all ergonomic, quality built and priced at approximately $160 to $600, depending upon the type you need. 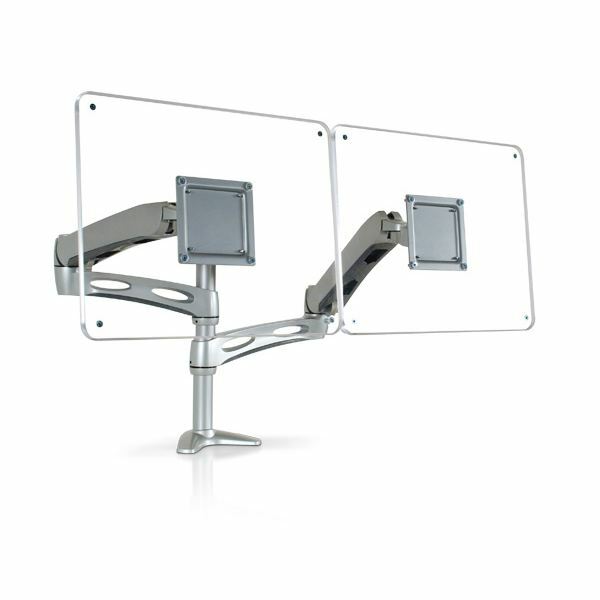 WorkRite SwingArm – Available in both silver and graphite, this single arm monitor stand is for flat panel monitors. The adjustable arm allows for swinging both left and right as well as height adjustments. If eye glare is a problem, this arm even offers a tilt feature. With a 10-year warranty, the just under $200 price you’ll pay is worth it. It frees up desk space and its swivel ball makes monitor adjustment for viewing a simple task. Flat monitors that already have a VESA 75mm or 100mm mount will find this single arm monitor easy to connect and its cable management features are top of the line. 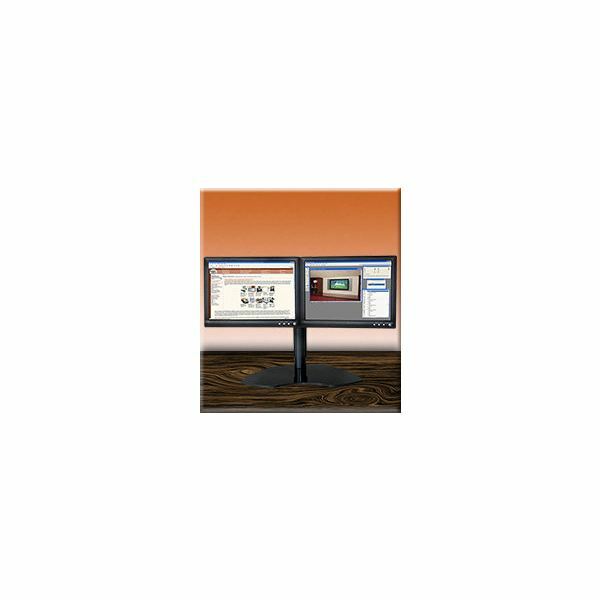 01 Series Multiple Arm Mount – Offered by Ergoware and made by ESI Ergonomic Solutions, this dual arm monitor arm is the perfect choice. Beyond your need for two monitors (and space saving), think single-client presentations here. You can choose from a grommet or clamp mount and this ergonomic computer monitor stand offers a 5 year warranty. The mounting post is 16 inches and made of an aluminum alloy. Its sturdy frame allows for easy adjustments and rotation needs; you can even switch from landscape to portrait view. The arm itself can extend up to 24 inches and is also VESA 75mm or 100mm ready. For around $300, this multiple stand will make your life at the computer much easier. For those on a budget, Amazon offers a range of ergonomic computer monitor stands starting at prices under $20. It’s worth a trip to Amazon for some browsing, especially if you take the bargain deals where ergonomic keyboards and monitor stands are set at low combo prices. If you feel your life is spent in front of the computer all day; or even at play, the investment in an ergonomic computer monitor stand or arm; or even one for the laptop is a must-have. You’re back, neck and eyes will thank you.